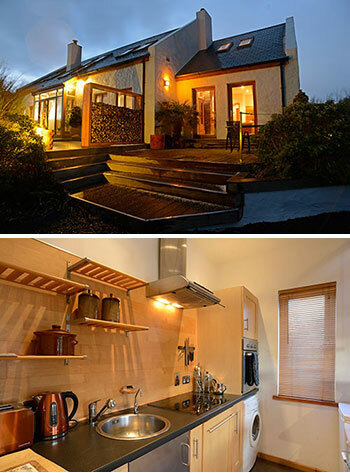 Westport self-catering holiday rental apartment – 57 sqm, maximum 2 + 1 persons / self catering – 1 double bedroom + gallery study loft, 1 bathroom. Luxurious, modern semi-detached duplex vacation apartment on Bertra Beach peninsular with spacious deck and spectacular views of Croagh Patrick. Ideal for 2 people who enjoy their space – with the option to bring a 3rd. person. The apartment has its own entrance and a large separate/screened deck with patio table/chairs and sun bed. Open plan living room with TV/video. Wireless broadband and parking . Kitchen with full cooking facilities – hob, oven, fridge, microwave and dishwasher + washing machine. 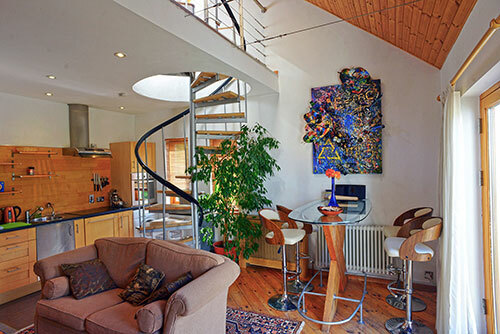 The gallery loft study is accessed by spiral staircase and has a desk, seating area and 1 single bed with a wardrobe. 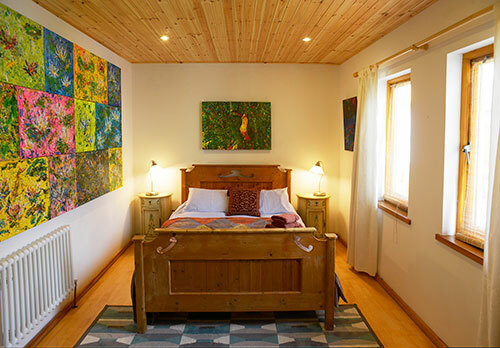 There is an extra charge of € 20/per night of booking for an extra guest staying in gallery. (Only available when booked at the same time as apartment booking and for the same number of nights). Location : Westport, Co. Mayo. Situated in a quiet cul-de-sac lane under Croagh Patrick, a short stroll from the Blue Flag Beach of Bertra Strand with sand dunes. 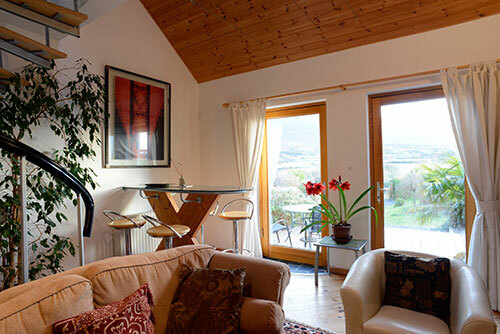 The property enjoys an amazing Croagh Patrick mountain vista. Located just 9 km from the beautiful town of Westport with its fantastic selection of shops, pubs and restaurants, music festivals, indoor pools and spas. Going west 9 km is the quaint village of Louisburgh with some of the finest surfing beaches in Ireland. There are 3 Pubs, Bar food / Restaurant in the nearby (1 km) villages of Murrisk and Lecanvey. 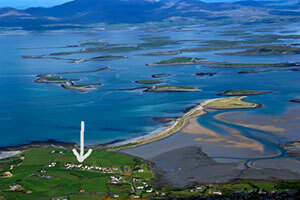 Amenities : This is a perfect location to combine a climb on Croagh Patrick with a beach holiday ie. swimming, shore- fishing, windsurfing, kite-surfing, sea-kayaking. Close by are Golf courses, surfing beaches, hill walking and bird watching areas. This area is a spectacular cycling area with many marked small cycling roads with trips to Killary Harbour, Silverstrand the the islands. 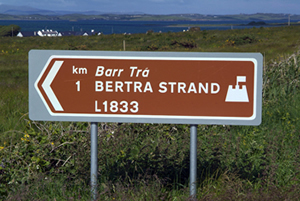 Greenway to Bertra Strand – The Clew Bay coastline is a spectacular cycling area with a cycle lane along the coast from Croagh Patrick to Westport that joins up with the newly opened GREENWAY cycle lane to Newport, Mulranny and Achill Island. Work has commenced to bring the Greenway to Bertra Strand past Bertra Lodge ! In 2019 guests can access the Greenway in front of Bertra Strand Apartments to walk or cycle to Croagh Patrick and the Pubs and Restaurants in Murrisk (approx 1 mile away). *Extra charge of € 20/per night of booking for an extra guest staying in gallery. 3 Night Breaks : ( not July / August) : Please contact us for a quote. Self-catering Service Charges : turnaround cleaning, electricity, heating, linen, towels, broadband and bins + € 50 / week or € 25 for 3 day break. Weekly Bookings Time frame – normally Saturday to Saturday in high season. Mid and low season 3 days minimum stay. (please vacate by 11 am to allow turn-around.) Discretionary Refundable Damage Deposit – € 50 Deposit returned in cash at checkout or paypal transfer. Low season € 250 / week. Receipt : We will confirm booking deposit payment with a receipt by email as soon as the payment is logged. On the same property we also have Bertra Strand Apartment for 2 guest and Bertra Beach Cottage for 2 guests. Depending on your needs these units can be rented together with ‘Croagh Patrick’ Apartment if you are traveling with friends or family. We are sorry – no dogs or pets. Non-smoking House – smoking outside only. Due to internal staircase/gallery and steps on deck/walkways and the pond with a waterdepth of 20-50 cm the property is not suitable for people with walking difficulties, babies or young children. There is no wheelchair access. 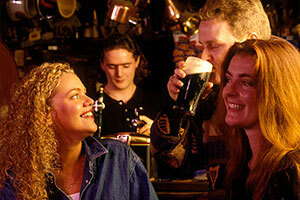 Besides the many Pubs and Restaurants in Westport and Louisburgh we have 3 local Pubs for a good pint of Guinness – (Campbell’s and The Tavern also serve good Food) in the local villages of Murrisk and Lecanvey (Stauntons) approx 1 mile away. Also recommended is the Shebeen Pub for food on the coast road before Westport.